NBA Basketball School Camp Greece 2019! Κορυφαίοι Καλεσμένοι στο 1ο NBA Basketball School Camp! 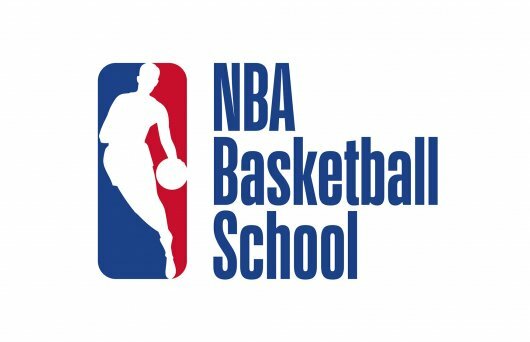 The NBA Basketball School curriculum, which is designed to help players, parents, coaches and organizations better understand the process of improvement, has been developed by the NBA’s Elite Basketball Development team in consultation with current and former NBA coaches, former NBA players, and player development experts. The comprehensive curriculum covers on court training, strength and conditioning, and basketball education for young players ages 6-18 and is implemented by local coaches working directly with the NBA’s International Basketball Operations staff around the world. In April 2017, the NBA launched The NBA Basketball School, a network of tuition-based basketball development programs open to male and female players from outside the U.S. ages 6-18. Additional NBA Basketball Schools have been launched in cities across India and Brazil, in addition to Kartepe, Turkey and Dubai, UAE. Fans in Greece can watch the NBA on Cosmote TV, the league’s official broadcast partner. We would like to inform you that a transfer service is provided for your convenience, from and to NBA Basketball School Camp facilities, from key points of Athens, in an extra cost 80 euros per period. Attention! Upon progressing your online registration form, you have to choose the bus service. If bus service is requested, a guardian must be with the child at the agreed time for the pick – up. If this is not possible, it is up to the parent to bring the child to the Camp. A guardian must also be at the designated stop in the afternoon to pick up the child from the bus. Children will be given ONLY to the persons designated by the legal guardians. If no one is at the pick – up point when the child arrives, the child stays on the bus for the completion of the route and is returned to the College; it is then parent/guardian’s responsibility to pick them up. Please be at the bus stop at the designated time to avoid causing delays in the schedule. Communication with the parents/guardians will be by email or cell phone. For a child to participate, it is necessary to complete the online registration form, and it is mandatory to submit the Medical Report form signed by a pediatrician. Τhe medical certificate can be sent by email to info@nbabasketballschool.gr or presented on the first day of the camp. Important Note: Without a medical certificate the athlete will not be able to participate in the program. The NBA Basketball School Camp is made with a certain number of participants based on priority of registration to ensure a high number of repetitions of each exercise to achieve maximum improvement. The limited number of athletes is considered necessary so that athletes receive the appropriate attention and supervision by our specialized coaches. We provide 10% discount on siblings. All athletes should arrive daily at 13.00pm at Deree – The American College of Greece. 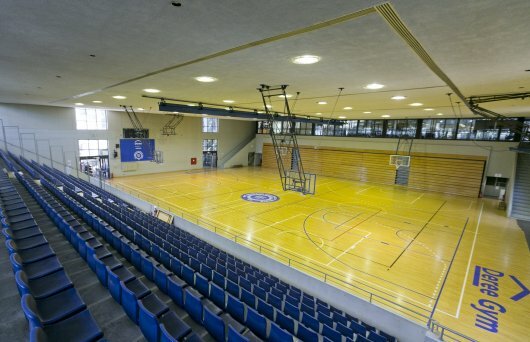 The NBA Basketball School Camp will be held at the state of the art training facilities inside the impressive campus of Deree - The American College of Greece. Founded in 1875, The American College of Greece is the oldest American-accredited college in Europe and the largest private college in Greece. The 64-acre campus hosts a vibrant student community, buzzing with academic societies and student clubs, sports teams, and art festivals, a perfect setting where to live the NBA experience. You can reach the Aghia Paraskevi campus via Messoghion Avenue (approximately 9 kilometers from downtown Athens) heading northeast of the city. Once you reach Aghia Paraskevi Square (church of Aghia Paraskevi), you take Aghiou Ioannou Street straight up towards Mt. Hymettus. The College Central Gate is at the end of the Street. Gravias Street passes in front of the entrance. You can reach the campus by using the Metro system (blue line No. 3) to Nomismatokopio station. From there, bus line 406 or 407 will take you to Aghiou Ioannou Square, four blocks (300 meters) away from the College’s Central Gate. You can take airport bus E94 (07:00-23:00) from the main terminal to the Aghia Paraskevi Square stop. Use Aghiou Ioannou Street to the Central Gate. You can reach the campus by taking the Attiki Road from the airport towards Athens. Take exit No. 16 (Imittos Ring) and follow signs to exit No. Y4 (Aghia Paraskevi). Follow the Gravias Street signs, make a left turn on Gravias Street to the College’s Central Gate. You can also reach the campus by taking the Attiki Road from Elefsina towards the airport. Take exit No. 13 to Immitos Ring and then take exit Y3 (Cholargos, Ag. Paraskevi). Turn left onto Neapoleos Street and immediately right onto Profiti Ilia Street. Make a right turn onto Peloponissou Street and continue for 600 meters. Turn right onto Irinis Street and then across the traffic lights onto Aigaiou Pelagous Street. Keep going uphill until reaching Gravias Street, where you take a left turn to the Central Gate. Parking on the Aghia Paraskevi Campus: Visitors can get inside the Aghia Paraskevi Campus to let their children safe and then must exit the campus. Με κορυφαία ονόματα καλεσμένων ξεκίνησε η πρώτη εβδομάδα του πρώτου Ελληνικού NBA Basketball School Camp που άνοιξε τις πόρτες του, τη Δευτέρα 02 Ιουλίου στις εγκαταστάσεις του Deree - The American College of Greece. Ο Ambassador του NBA, Ευθύμης Ρεντζιάς και ο Ντράγκαν Τάρλατς καθώς και ο Neal Meyer, Associate Vice President of Basketball Operations EMEA καλωσόρισαν την πρώτη βδομάδα μεγάλα ονόματα της καλαθοσφαίρισης, που ανταποκρίθηκαν με ενθουσιασμό στην πρόσκληση του NBA Basketball School Camp και έδωσαν το παρόν εκπλήσσοντας τους νεαρούς αθλητές. Ο Φώτης Κατσικάρης ήταν ο πρώτος καλεσμένος του NBA Basketball School Camp. Αναφερόμενος στις εμπειρίες του από την παρουσία του στους πάγκους μεγάλων ομάδων, αλλά και από την περίοδο που ήταν παίκτης μπόρεσε να μεταφέρει την φιλοσοφία του για το μπάσκετ στους νέους και ανέλυσε τις διαφορές του αμερικάνικου με το ευρωπαϊκό μπάσκετ. “Είναι πάρα πολύ σημαντικό ότι γίνεται ένα καμπ υπό την αιγίδα του ΝΒΑ και δίνεται η δυνατότητα στα παιδιά να γνωρίσουν ένα πρόγραμμα πιο εξειδικευμένο. Γίνεται μία πιο άμεση επαφή με τον κόσμο του ΝΒΑ, επειδή κάθε χρόνο όλο και περισσότερα παιδιά παρακολουθούν το ΝΒΑ. Είναι σημαντικό με τις δυνατότητες που τους δίνονται με έναν άνθρωπο σαν τον Neal Meyer, που ασχολείται χρόνια με αυτό και θεωρώ ότι ξεκινώντας για πρώτη φορά στην Ελλάδα θα έχει μία καλή συνέχεια και τρομερή επιτυχία”. Δεύτερος καλεσμένος ήταν ο πρώην διεθνής καλαθοσφαιριστής, Θοδωρής Παπαλουκάς που είναι ένας από τους κορυφαίους point-guards όλων των εποχών στην Ευρώπη και ο πρώτος Έλληνας μπασκετμπολίστας που αναδείχτηκε MVP σε Final 4 της Euroleague. O παλαίμαχος άσος της Εθνικής και μεταξύ άλλων του Ολυμπιακού, της ΤΣΣΚΑ Μόσχας και της Μακάμπι, με την πολυετή εμπειρία του στα γήπεδα και στις ακαδημίες και τους πολυάριθμους τίτλους και διακρίσεις, μίλησε στα παιδιά για το αθλητικό ιδεώδες και απάντησε σε όλες τις ερωτήσεις τους. "Είναι ένα από τα πιο οργανωμένα camp που γίνονται στην Ελλάδα και κάθε τέτοιου είδους διοργάνωση προάγει το άθλημα και βοηθάει τους νεαρούς αθλητές να γίνουν όχι μόνο καλοί αθλητές, αλλά και καλοί άνθρωποι." "Σας ζηλεύω, αν είχαμε τότε την στήριξη ενός προγράμματος από το ΝΒΑ σαν και αυτό το camp που συμμετέχετε, μπορεί να γινόμασταν καλύτεροι παίκτες. Έχετε την ευκαιρία να δουλέψετε και να μάθετε τα βασικά του μπάσκετ με τον καλύτερο τρόπο. Εγώ δεν είχα την ευκαιρία να παίξω από νωρίς, έπαιζα άλλα αθλήματα και σιγά σιγά αγάπησα στο μπάσκετ. Να θυμάστε πως όπως μαθαίνετε να κερδίζετε πρέπει να μαθαίνετε και να χάνετε. Δεν είναι ό,τι πιο εύκολο. Υπάρχουν νίκες αλλά και ήττες. Ποτέ όμως μην σκεφτείτε να τα παρατήσετε. Το πόσα πρωταθλήματα κερδίζει κανείς είναι απλά μια στατιστική. Μέσα από τον αθλητισμό γίνεσαι καλύτερος άνθρωπος και αυτό είναι το σημαντικό." από προπονητές που έχουν εγκριθεί από το NBA και θα συνεχιστεί και την επόμενη εβδομάδα για την δεύτερη περίοδο με πολλούς και εκλεκτούς καλεσμένους! In April 2017, the NBA launched The NBA Basketball School, a network of tuition-based basketball development programs open to male and female players from outside the U.S. ages 6-18. NBA Basketball Schools have been launched in Mumbai, New Delhi, Pune and Punjab, India. Fans in Greece can find more NBA information at NBA.com/Greece, the league’s official online destination in Greece, on Facebook (NBA Hellas) andTwitter (@NBAHellas). Fans can download the NBA App for news, updates, scores, stats, schedules, videos and more. The NBA is a global sports and media business built around four professional sports leagues: the National Basketball Association, the Women’s National Basketball Association, the NBA G League and the NBA 2K League, set to launch in May 2018. The NBA has established a major international presence with games and programming in 215 countries and territories in 50 languages, and merchandise for sale in more than 125,000 stores in 100 countries on six continents. NBA rosters at the start of the 2017-18 season featured 108 international players from a record 42 countries and territories. NBA Digital’s assets include NBA TV, NBA.com, the NBA App and NBA League Pass. The NBA has created one of the largest social media communities in the world, with 1.4 billion likes and followers globally across all league, team, and player platforms. Through NBA Cares, the league addresses important social issues by working with internationally recognized youth-serving organizations that support education, youth and family development, and health-related causes. Fourteen Pro is a highly skilled sports event management company based in Greece. We excel at innovative projects, bringing our expertise in a wide range of services, forming the best team and network to deliver goals and objectives in a unique and successful process. We have the skills, the background and the knowledge to successfully and profitably manage in style any event or project, exceeding expectations. One of our aims is to contribute to efforts promoting core values for youngsters and bringing them closer to the best development programs of the world by pursuing excellence and pushing boundaries. 1. General rules of participation. 1.01. The NBA Basketball School Camp Greece (hereinafter called the "NBA Camp Greece 2019") is operated by the company FOURTEEN PRO Ε. RENTZIAS AND PARTENERSHIP (hereinafter called the "Company") at the sport facilities of American College of Greece (6 Gravias Str., 15342, Agia Paraskevi, Attica), under the terms and conditions of the contract signed between the Company and the foreign company NBA Properties Inc.
1.02. The program, dates and exact hours of NBA Camp Greece 2019 shall be posted on the official site www.greece.nbabasketballschool.com. 1.03. Children from 6 up to 18 years old are eligible to apply for the NBA Camp Greece 2019. 1.04. For a child to participate in NBA Camp Greece 2019, a Medical Report signed by a pediatrician shall be submitted. The Medical Report shall be either sent by the parents/guardians to the e-mail address info@nbabasketballschool.gr prior to the opening day of NBA Camp Greece 2019 or submitted before the authorized employee of the Company at the opening day of NBA Camp Greece 2019. 1.05. If the parents/guardians fail to submit the Medical report in due time, the Company reserves the right to deny the participation of their child in NBA Camp Greece 2019. In this case, no refund of the registration fees shall be given. 1.06. During their participation in NBA Camp Greece 2019, the children shall be dressed in athletic clothes and shoes. Use of cell phones are prohibited, except if an emergency case occurs. 1.07. The parents/guardians are responsible to bring and pick-up their children from the respective sport facilities in accordance with the designated program of NBA Camp Greece 2019. 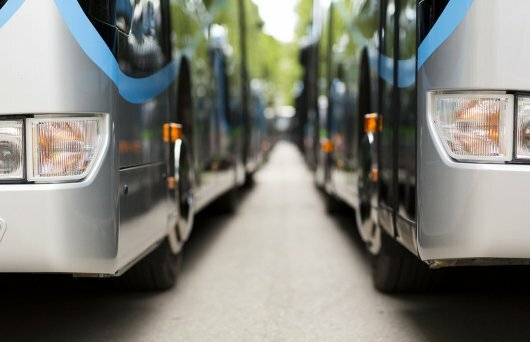 If the parents/guardians wish their children to use the bus that will be rent by the Company for this purpose, they must advise the instructions and/or information posted on the official site of NBA Camp Greece 2019 and communicate with the authorized employee of the Company. In case of failure to attend NBA Camp Greece 2019 in due time, no refund of the registration fees shall be given. 1.08. The Company is not reliable for any injury and/or health issue that may accrue to the children as a direct or indirect result of their participation in NBA Camp Greece 2019 and/or due to any negligent and/or irresponsible behavior of the children and/or breach of the Rules of Participation and/or for any loss of any personal property of the children. 1.09. 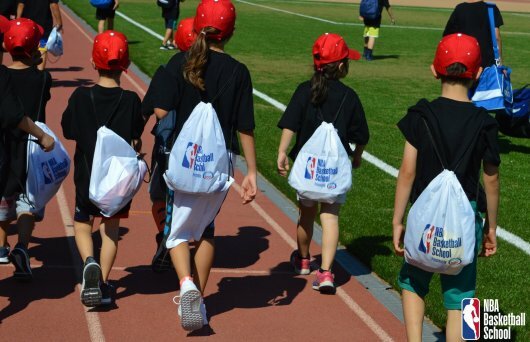 The Company reserves the right to suspend the participation and/or expel any child from NBA Camp Greece 2019 in case of any negligent and/or irresponsible behavior and/or failure to comply with the Rules of Participation. In this case, no refund of the registration fees shall be given. 2. Processing of personal data. 2.01. The Company, acting as Data Controller, hereby informs the parents/guardians of the children who will participate in NBA Camp Greece 2019 that collects, processes and stores in electronic or paper form any personal data contained in the Registration Form (i.e. Child’s First Name, Child’s Last Name, Father’s Name, Date of Birth, Size of T-shirt, Child’s/ E-mail, Child’s Cell Phone Number, Child’s Health Data, Guardian’s First Name, Guardian’s Last Name, Guardian’s I.D. Number, Guardian’s E-mail, Guardian’s House Telephone Number, Guardian’s House Address, as well as any payment information) in accordance with the applicable legislation, namely, today, Law 2472/1997 and as from 25.05.2019, Regulation (EU) 2016/1979 (General Data Protection Regulation), as in force. (ii) the collection, processing and storage of parents’/guardians’ personal data are deemed to be necessary for the execution of our agreement and/or for our immediate communication with them in case of any medical emergencies and/or any issue that may occur in relation to the participation of their children in NBA Camp Greece 2019. 2.03. The aforementioned personal data shall be processed by the authorized employees and/or competent external associates (legal counsels and/or accountants) of the Company, solely for the proper execution of our agreement and shall not be transferred to any third person outside Greece without the prior consent of the parents/guardians of the children. However, it is explicitly stated that the Company reserves the right to transfer any photos and/or videos of NBA Camp Greece 2019, in which the participants children may appear, to the foreign company ΝΒΑ Properties Inc., having its seat in United States of America (U.S.A.), in order for ΝΒΑ Properties Inc. to post them in its official site and/or in its social media account for a time period of two (2) years, solely for the purpose of promoting NBA Camp Greece 2019. 2.04. The Company shall process the aforementioned personal data for a time period of two (2) years and/or for any additional time is required for the aforementioned purposes of processing and/or for the compliance of the Company and/or to defend itself against any legal claims. However, is explicitly stated that as far as the children’s health data are concerned, the Company shall erase them within thirty (30) days of the completion of NBA Camp Greece 2019, except if a medical emergency occurs during NBA Camp Greece 2019. 2.05. As data subjects, the parents/guardians reserve the right to know if their personal data and/or the personal data of their children were processed and/or are being processed. Additionally, the parents/guardians may exercise their right of access, rectification, restriction of processing, objection, erasure, portability and/or any other right provided for in the applicable legislation, namely, today, Law 2472/1997 and as from 25.05.2019, Regulation (EU) 2016/1979 (General Data Protection Regulation), as in force and/or withdraw their present consent at any time and/or file a complaint before the competent Data Protection Authority. 2.07. Finally, the Company is bound to take all necessary technical and organizational measures so as to ensure the safety of the aforementioned personal data and/or to protect them from any random and/or abusive destruction, loss, corruption, illegitimate transfer and/or access and any other abusive processing. 3. Declaration - Assumption of Risk - Release of Liability. (ix) He irrevocably agrees and provides his explicit consent to the Company so as to transfer any photos and/or videos of NBA Camp Greece 2019, in which his participant child may appear along with other children, to the foreign company ΝΒΑ Properties Inc., having its seat in United States of America (U.S.A.), in order for ΝΒΑ Properties Inc. to post them in its official site and/or in its social media account for a time period of two (2) years, solely for the purpose of promoting NBA Camp Greece 2019. FOURTEEN PRO Ε. RENTZIAS AND PARTENERSHIP (hereinafter called the 'Company'), enables the Internet visitor/user to be informed about NBA Basketball School Camp Greece, which is operated by the Company, under the terms and conditions of the contract signed between the Company and the foreign company NBA Properties Inc and to make use of the pages and the services on offer. 1. Intellectual and Industrial Property Rights - Trademarks. Apart from explicitly mentioned exceptions, the entire content of this website is the property of the Company or the proprietor of each specific case and therefore, protected by the relevant rules, regulations and provisions of the Greek, European and International Law. To this extent, it is explicitly stated that any video, audio, text, images, statistics, updated scores, logos and other intellectual property related to the NBA and its member teams, are owned by NBA Properties Inc. throughout the territory of the world in perpetuity. No distribution, publication, reproduction, display, modification, adoption, broadcasting, transmission and/or any other use of the content of this website is permitted for public or commercial purposes on any other website or otherwise without the prior consent of the Company or the NBA Properties Inc. or the proprietor in each case. The Company does not bear no responsibility if underage visitors/users elect to visit the website, without the prior consent of their parent/guardian. 3. User’s code of conduct. The visitor/user shall comply with the rules, regulations and provisions of the Greek, European and International Law and to refrain from any illegal or abusive conduct. This website may contain links, hyperlinks and banners, which may direct you to third party websites and pages. The Company does not warrant and bears no responsibility for the content and/or personal data protection policy and/or confidentiality, quality, legality, completeness, availability and actuality of the services of other websites and pages, which it may direct you via links, hyperlinks and banners. Apart from the personal data collected through the online NBA Basketball School Camp Greece’s Registration Form, the processing of which shall be made in accordance with the Rules of Participation signed by the respective parent/guardian of the participant child and in accordance with the applicable legislation, namely, today, Law 2472/1997 and as from 25.05.2019, Regulation (EU) 2016/1979 (General Data Protection Regulation), as in force, the Company shall not process any further personal data from any visitor/user of this website.